When we wanted to create a poster about water we defined the art style first. It had to be simple yet enticingly beautiful. Water is one of the greatest resources and our bodies are made mostly of water. 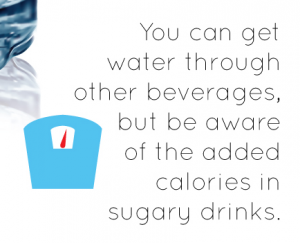 By choosing water over the other sweetened beverages individuals can really dig in on a path of better health. Plus the poster had to have a scientific infographic format. So we sketched up the data and the specs and gave it to our best graphic artist. When he came back with this one I knew we had a winner. The title is so gorgeous it makes water look better than soda, at least on paper! 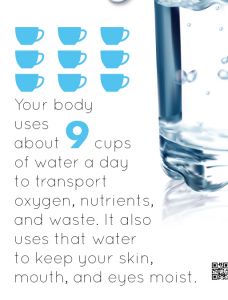 You need 9 cups a day because your body uses water for many important functions! Now we are giving them a reason to do more of something instead of less! And your body is comprised of 60% water! Every system in your body uses water! 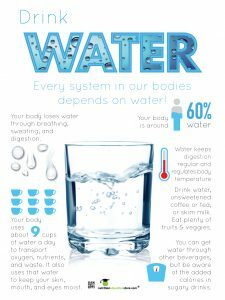 The water poster is ready to go in the NutritionEducationStore.com now – along with many other items that will match such as stickers, bookmarks, banners, and wristbands. Custom - Are You Drinking Candy? Sugar and Beverage Awareness Vinyl Health Fair Banner 48" x 36"